When you need to edit an image, photoshop will be opened for it.But sometimes it can be troublesome.Also, photoshop is a great software and requires more ram to run.For example, you are opening the Google Chrome Browser.A friend later sends you a picture.Imagine that you need to add a text.So what are you doing for this? Actually, it's often done through photoshop.But google chrome is a web browser that uses a large ram.So with Photoshop open it will slow your computer.So you can use an online tool for photo editing.Your computer is not slow because it can be on your web browser.Also, using this online tool makes it easy to work on a windows computer and windowless computer.So, we've brought some online tools to help you edit such photo today.They can be used without sign up. Also read The Most Important Website for Your Graphic Designs. If you add an important file to internet, such as a credit card, vehicle or a roadside view, Some parts need to be blurred.To do this in Photoshop, open the desired photo, and select the partition from the Marquee Tool, and then select Filter> Pixelate> Mosaic from the menu item.Or use the Blur tool on the toolbar.But you do not have to open photoshop for this.When you visit imageblur.io, browse or drag the necessary photo and select its desired partition, and then click on the yellow blur button to blur that section.Then the photo will be re-downloaded through the Continue button. If you're sending a screenshot, It should be well visible.You need to edit it.When you introduce products like software, websites, etc., it's best to put it in a professional, back-shadow, back-up color, and so on.So, to edit your screenshot, photoshop can be quite difficult to use.Instead, press the PrintScr key on the keyboard, enter the screely.com web page and paste the Ctrl + V shortcut to automate this.Then window decorations are added.This tool is still in its early stages and will include features such as changing GIF, editing photos. Also read The Best 5 Screenshot Editing Apps For Android. If you make meme, to add a name or website to your posting, If necessary, the addtext.com website makes it easy.Not just adding letters but also, After uploading the photo, add as many textbox as possible, allowing them to have different fonts, colors, sizes and placement.Because it contains many default fonts similar to Word Art, blending options like Photoshop do not have to be time consuming.When used free, the bottom right corner of the image will add a watermark from the website.If you want to make a card with an image, picfont.com can do it.Because they have default designs, you do not have a problem without a photo. Adding photos to social media sites requires different sizes.There are different image size for facebook profile, cover, Twitter and Google+.When uploaded without proper processing, it does not automatically compile the partitions we need to show when it is set up automatically.But if you add a single photo to many social networks, it is difficult to make every image.In such cases, the Social Image Resizer Tool can be used.A large-sized photo uploads it and select the box next to Choose a size from the selection box to select the type of photo you need to crop. If you want to create anything beyond the above basic photo editions, There are many websites that offer free services.LunaPic has many tools.To blur the photos, add Photoshop, as well as add various effects and even create animations using several photos.Pixlr is a well-known online photo editor.But Flash using was suspended in Web browsers because pixlr was coming to the low state.But, if your browser has enabled Flash, you can still work.The Fotor website is best suited for instantly adding stickers, text, frames, and photos to create a social networking site such as Instagram.In addition to this, it allows for volume changes, eye shadow, teeth, and make-up. Also read How to Edit an Image Without Installing Adobe Photoshop? 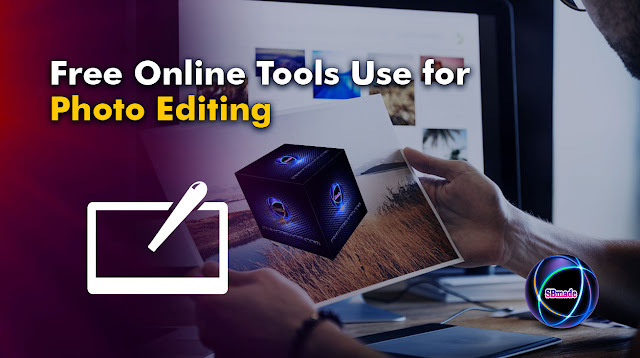 So you know about Online Tools Use for Photo Editing, Hope you like the post, don’t forget to share it with your friends and leave a comment below if you are facing any problem at any step in the method discussed above.Thank you.